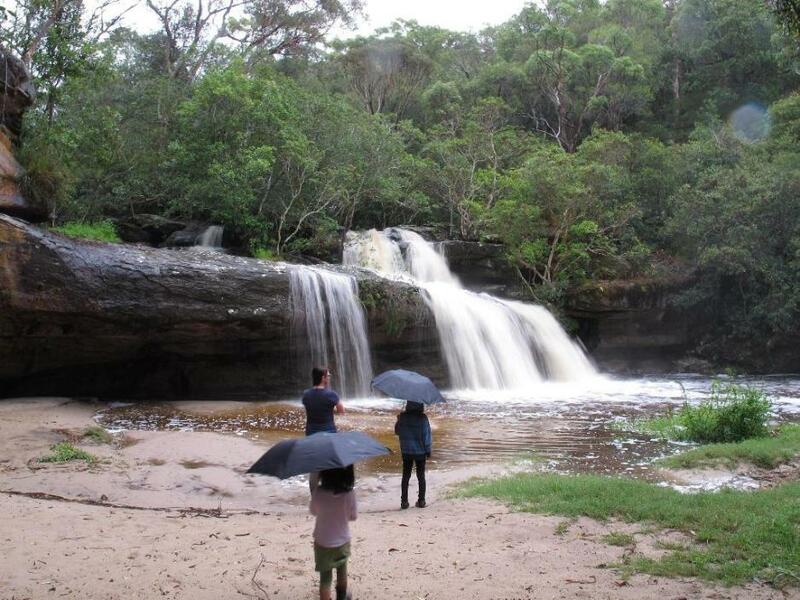 The new Mullet Creek Bushcare group planted about 120 trees and shrubs near Irrawong waterfall on April 21. They also put up a wire fence to keep them safe from the local swamp wallabies. Some familiar bushcarers were there, but also many local people. For many of them this was a new experience. The weather was perfect, the waterfall was roaring, Scarlet Honeyeaters were chirping high up in the Swamp Mahoganies, now coming into bloom. The afternoon tea was magnificent too. A Large Project grant to Pittwater Environment Foundation from NSW Environment Trust is funding six years of bush regeneration and fauna monitoring in the Upper Mullet Creek area. Pittwater Council is a partner in this project. Being amongst the beauty of the bush, birds and other animals in this part of Ingleside Chase Reserve are really special, attracting birdwatchers from far and wide. Lyrebirds and swamp wallabies are sometimes seen here, as well as Eastern Yellow Robins, Rufous Fantails and other birds that enjoy the eucalypt forest and rainforest environment. This forms part of largest remaining sandplain wetland in Sydney, has the largest remaining stand of Swamp Mahogany in Sydney, is home to three endangered ecological communities of vegetation and is the habitat of over 20 threatened species of fauna including birds, mammals, reptiles and amphibians and over 170 species of birds including some 10 migratory species. This small tree has black branches that grow more than 1 m long. Pale, heavily scented flowers have no petals or sepals and appear in summer. The urn-shaped berry is 15-20 mm in diameter and turns from green to brown through winter. Where it is found: Bolwarra is widespread in or near warmer rainforest and moist eucalypt forest on the coast and lower ranges. In New South Wales it is found on the coast and tablelands. It also occurs in Queensland, Victoria and New Guinea. Uses: Bolwarra berries have an interesting taste with soft, sweet flesh and strong, spicy seeds. The whole fruit can be dried, crushed and used to flavour foods such as ice-cream. The fibrous bark was used as raw material for manufacturing fishing lines (Turbet 1989). The bark was prepared in the same way as that described for Eucalyptus agglomerata. Marita mentioned a symbiotic relationship with a caterpillar is required for pollination; Michael Mannington. Coast Banksia is now providing honeyeaters and lorikeets with a feast . Local birds such as Little and Red Wattle Birds, White-cheeked Honeyeaters and the inescapable Noisy Miners rejoice in this Banksia. In turn they pollinate the flowers which will produce seed next summer. Each Banksia "flower" in fact has hundreds of tiny flowers, an arrangement called an inflorescence. On this, the flowers open in succession over a couple of weeks, starting at the top, so the feast is prolonged. The botanical name Banksia integrifolia means it is named for Sir Joseph Banks. Most Banksias have leaves with saw-tooth edges. This one does have such leaves as a very young plant, but as an adult the leaves have smooth edges so integrifolia means the leaves are whole. The hard work of heavy weeding has been done by bush regeneration workers, funded by a $250K grant to Pittwater Environmental Foundation (PEF)from the NSW Environmental Trust, a project that will run over 6 years. Now the pleasure of planting is taking place to restore this wonderful place. Two Bush Care days are coming up offer everyone who visits this reserve or lives near here to invest in this great project; yes, you can plant a tree and then wander among the bush for years to come, seeing it grow. Sunday May 19th, 1pm - 3pm. Park near the corner of Irrawong Rd and Epworth Place, Warriewood and follow signs to the planting site. Wear long trousers, long -sleeved shirt and sturdy shoes, bring gardening gloves. Tools and afternoon tea provided. Mullet Creek's south arm near Wesley Street Elanora is also being weeded and the planting day here is on Sunday May 26, 9am to noon at the Wesley St entrance, Elanora. Wear long trousers, enclosed shoes and bring gloves. We'll do a fabulous morning tea, supply tools and plants. What happens upstream in a catchment affects the creek downstream. Weed, seeds and pollutants are easily transported down through the catchment and stormwater drains to end up in the creek and wetlands. By some simple actions, you can improve the health of this dynamic creek ecosystem! Put weeds, lawn & garden clippings in compost or vegetation bins. Protect wildlife by keeping dogs on a lead and cats inside at night. Use No-Phosphate detergents, slow release fertilisers and low-toxic garden sprays. Wash your car on the lawn and contain any oil leakage. Encourage native animals: plant local native plants; install a frog pond, nest box or rocks and logs for lizards. Cover bare soil or sand with a tarp, mulch or plants. Repair erosion. Don’t use snail bait or toxic garden chemicals – they kill native fauna. Don’t wash your car on a driveway. Don’t dump rubbish, oil or chemicals. The first volunteer day in the rescue of Mullet Creek. "Incantation" courtesy of www.agostinomusic.com - duo Agostino guitars. The waterfall in flood on 2/2/13, photo by Marita Macrae. Photos by Marita Macrae and Michael Mannington, 2013. Video courtesy John Illingsworth, Pittwater ECOWARRIORS.